Are you looking for a Lakeside Cabin Resort in Ely MN that has everything you could want around the Boundary Waters? Moose Track Adventures is located only 7 miles from Ely Minnesota and just outside the Boundary Waters. Our Lakeside Cabin Rentals in Ely include all the majesty and personal touch you expect from an Ely resort. You can wake up and see the fog dancing across the lake, the sun reflecting its beauty off the waves and hear the birds sing a morning melody. So what are you waiting for? Your Boundary Water Adventure awaits! The property surrounding the cabins also has a beach, playsets and a welcoming lodge. 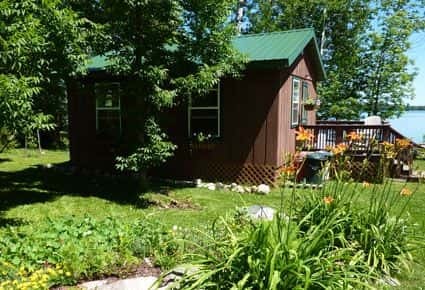 With a cabin at Moose track Adventures you can enjoy a beautiful view of Farm Lake and all the amenities you would expect from a Lakeside Cabin Resort. You’ll feel like you’re miles away from civilization but in reality, the tourist capital of the Boundary Waters, Ely, is only a 10 minute drive away. Our two and three bedroom housekeeping cabins are situated only 25 feet from Farm Lake, part of the White Iron Chain of Lakes. Enjoy incredible sunrises from a large living room picture window and evening dinners at your lakeside picnic table or on your deck. Each cabin has a personal touch and is fully equipped, extremely clean & includes heat, hot water showers, microwave, stove, refrigerator, kitchen utensils & all linens (except kitchen & bath towels). A picnic table, charcoal kettle grill and a fire ring for a nice campfire are also included with each cabin. One dock space is included with a weekly rental. All cabins can accommodate four people easily, six people with no problem and some allow for eight. In the dark of night, no matter how far away you are from home, cozy into your cabin beds with ease thanks to our newly upgraded memory foam beds and high thread count sheets. And for your convenience our Ely Minnesota Resort offers wood bundles, ice, live bait, a selection of fishing tackle for sale. If your dog is well-socialized with people and animals and has no problem being off or on leash – we welcome them warmly! Moose Track Adventures is a Dog Friendly Lakeside Ely Resort and in fact, we have two of our own golden retrievers roaming around all the time. They love meeting new friends, whether they have two legs or four legs. We do ask that your dog or dogs are not left unattended at any point when you stay at our resort and we have a pet fee for each animal. 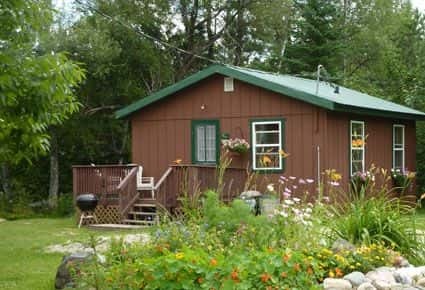 Moose Track Adventures is rated the best Ely MN Resort because we offer our guests exceptionally clean, newly remodeled and modern lakeside cabins, attractive North Woods landscaping with native flowers, trees, have personalized service and are pet friendly. Moose Track Adventures, a Boundary Waters and Ely Resort, has been rated #1 out of 32 other Ely Resorts and Specialty Lodging options on Trip Advisors for years (Trip Advisors is one of the world’s largest travel sites, one of their main focuses is providing unbiased reviews). There is nothing we can say about our Ely Resort that would surpass what our visitors have already expressed. Our reputation is based on our clients’ reviews and we are ecstatic that our guests appreciate all the effort we put into our Lakeside Cabin Resort to ensure a Boundary Waters experience worth having. Many of our guests express that our photos are an exact representation of our Ely Lake Cabins, so be sure and take a look. We are happy to assist you in your enjoyment of all that Ely has to offer, both inside and outside of our lakeside resort. Below are our 6 cabins. To see the inside pictures of each cabin and rates, please click on the individual cabin names or from the drop-down menu at the top of the page. Bear Paw Cabin – This cabin is situated nearest to the lodge and is the first one seen by our guests and is just feet from the lake, with a beautiful picture window view of the water, private dock and cozy landscaping. This fully furnished cabin has two bedrooms, both with full sized beds and all the necessities of cabin living, with the exception of towels. Bald Eagle Cabin – Down the trail to the left is our Bald Eagle Cabin. The dining room of this 2 bedroom cabin has a large window overlooking the beautiful lake and fully stocked bird feeders so you can gaze at Blue Jays, Woodpeckers, Hummingbirds, American Goldfinch and many other birds. This lakeside cabin is fully furnished, with two full sized beds, a dock, deck and a stone fire pit. Loons Nest Cabin – Close to Bald Eagle Cabin you’ll find Loons Nest Cabin, this lake cabin shares the same comforts as most of our Ely Cabin Rentals. With two bedrooms, a futon and everything to help induce the three R’s of summer: Rest, Relaxation and Rejuvenation. And because it’s only a couple steps from the dock. Moose Antler Cabin – Next to our beach is Moose Antler Cabin, a great choice if you have multiple kids and you’d like two full sized beds, with a bunk over one and a futon in the main area. This cabin is close to the playset and is a great beachside, family cabin rental option for younger kiddos. Wolf Den Cabin – Another family friendly lakeside cabin and perhaps the easiest socialization spot is Wolf Den. This cabin has 2 bedrooms, one with twin bunks, the other with a full sized bed and the main area has a futon. It is right on the beach and allows kids to stretch their legs after a long boat ride and have shallow access to the lake while you can see them comfortably from the cabin, deck or picnic tables. NEW May 2019 – large 3 bedroom lakeside cabin with 2 full bathrooms. If you’re looking for a cabin with a view in Ely, MN, you have found the perfect destination! Our Minnesota Lake Cabins have all the comfort you could ask for, views you’ve envisioned and a clean, yet rustic feel you won’t find anywhere else in Northern Minnesota. If you’re planning a Northern Minnesota Getaway, call Moose Track Adventures and you won’t be misled. Our seasoned Ely Resort operators can give you fishing advice, show you the sweet spots on Farm Lake and even guide you on your journey. 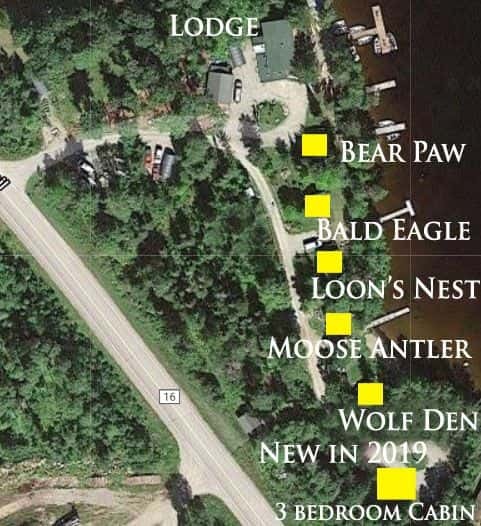 Whether you rely on the power of a paddle, motor or you like fishing off the dock, you’ll be sure to relish in the sun and the stars at Moose Track Adventure in Ely Minnesota. Find a little slice of heaven by renting one of our beautiful Ely Lake Cabins contact us by phone, our preferred method, at 218-365-4106 to check our May through September availability. Every sunrise and sunset in Ely is a sight to behold. Start and end your day closer to your roots and rediscover the beauty in this world with a little help from Moose Track Adventures.